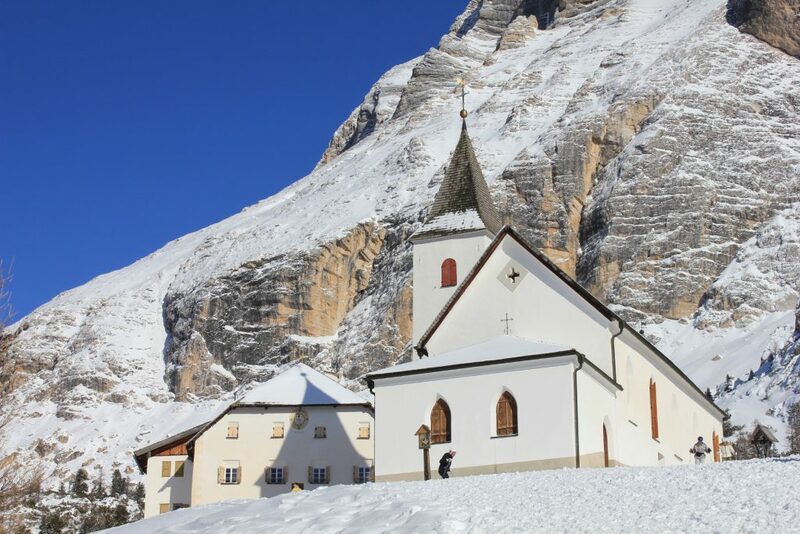 The “Santa Croce” church is the heart of La Crusc. Hidden behind the walls of this popular pilgrimage site is an exciting, centuries-old history. Long before Badia was settled, Santa Croce was likely a place of pagan worship. Poor living conditions probably motivated Christians to erect an empowering shrine at this location. For many years, the only documents associated with the existence of this pilgrimage site originated from the year 1511. Later, two parchments were uncovered to support the earlier existence of the church. The first described a church dedication, the second told of the history of “Morellus de Caninis,” who travelled to Rome in 1500 to ask for indulgence for the church. As a result, the priest decided to hold six masses in the Santa Croce church every year. This devotion has been celebrated ever since on the first Sunday of every year as well as with many processions during the summertime. 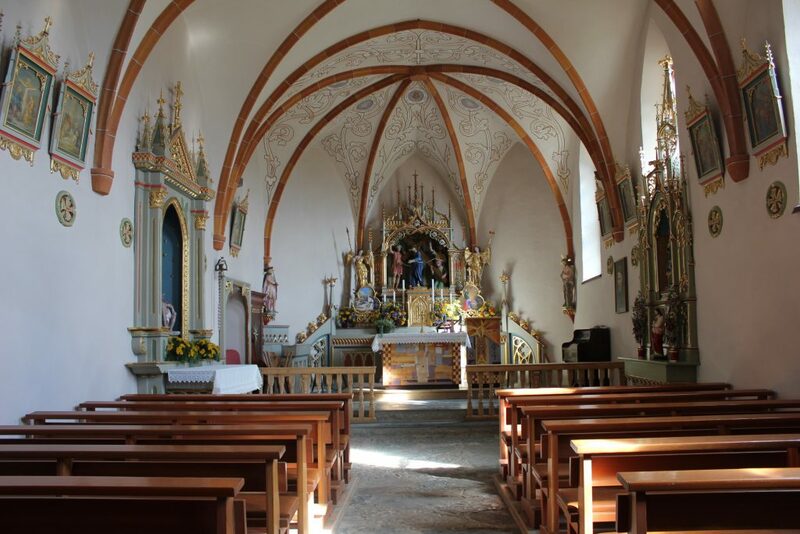 Countless relics are protected at the church altar, like for example those of Saint Leonhard (to whom the church Saint Leonard in Badia is consecrated), Saint Hippolitus, Saint Virgilius (Bishop of Salzburg), Saint Maria Magdalena, Saint Agnes and Saint Barbara. 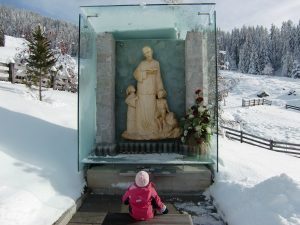 Many hundreds of years ago, the residents of Badia wanted to erect a chapel on the “Col d’Alvi”, a hill on the north side of San Leonardo/Badia. During construction, village residents repeatedly injured themselves with splinters of wood. According to legend, white birds are said to have brought the blood-stained splinters to the foot of the Santa Croce mountain. The construction workers noticed this and followed the birds to find out where they were flying. When they saw this enchanting and mysterious place at the foot of the mountain, they decided to build their church here, as they seemed to recognise the will of God. Ottwin, Duke of Lurn and the Val Pusteria valley, made a pilgrimage to the holy land. During his return journey, Arion seized him and he had to agree to return home with his non-believing priests. Some time later, Ottwin regretted this decision and moved to the foot of the Sasso Santa Croce massif to pay penance. Here, he erected a chapel as a symbol of his belief. The church continues to be a favoured destination for pilgrims from around the world. Processions to holy sites originate from nearby villages and are followed by church services. 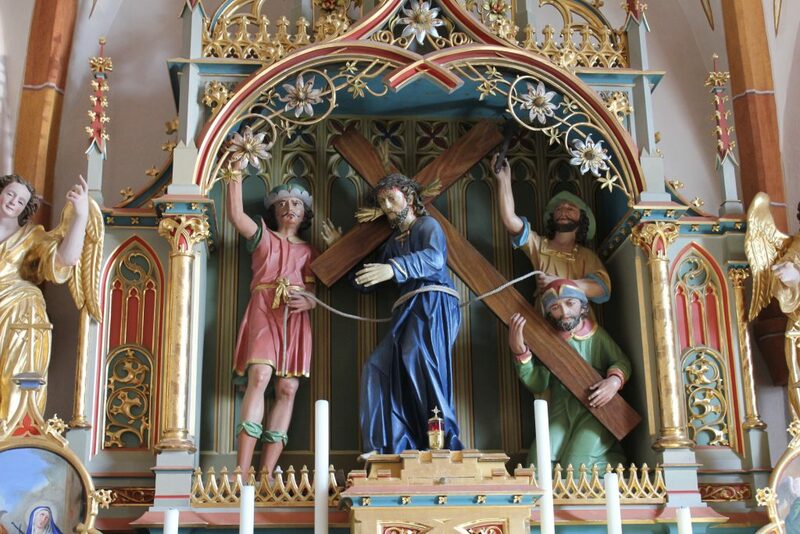 Three different paths, each a “Way of the Cross,” lead to the church. 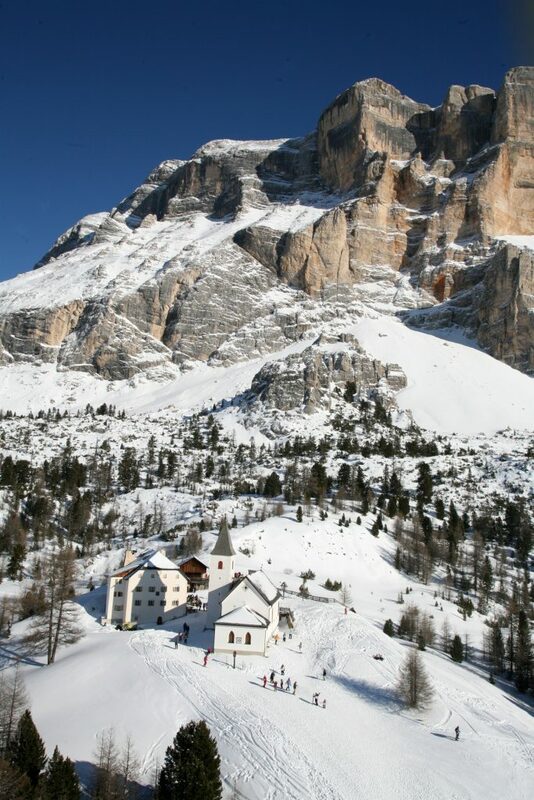 One starts at the nearby mountain station of the “Santa Croce” chairlift, one is located at “Trail no. 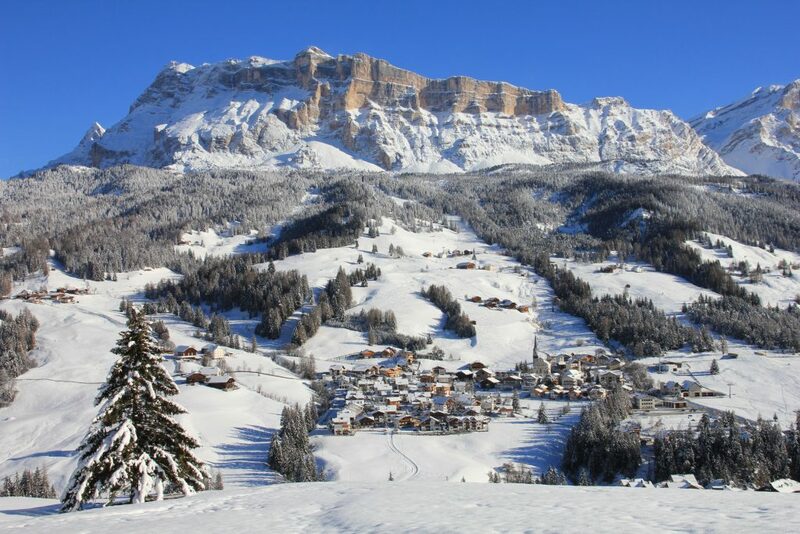 15” which starts at San Cassiano, and the other follows the “Trail no. 13” which starts at Castalta. The La Crusc ski area can look back on a long history – though it continues to reinvent itself. The authentic interplay of tradition and modernity make this place something truly special. The first cable car travelled to the site of today’s mountain station at La Crusc in the year 1960. In 1993, with the construction of the “Pradüc” chairlift, the Badia and La Villa ski villages were connected to one another. This project contributed to the modernisation of the entire lift infrastructure system as well as snowmaking facilities. In 1995, the two-person chairlift was replaced by a four-person chairlift to make reaching La Crusc even faster and more comfortable for guests. The chairlift is open to hikers and skiers in winter and in summer. In 1998, the “La Crusc” chairlift featuring a conveyor belt was built, which leads up to the Santa Croce pilgrimage church. It replaced a simple t-bar. The slopes have been consistently expanded in order to offer guests more space. Presently, they are 4 km long and boast a difference in altitude of 700 m. In 2005, the “Pradüc” chairlift was constructed. At the valley station of the Santa Croce chairlift, a building with ticket counters and space for personnel, guests and emergency response teams was created. In 2010 the “Skiland” was also integrated. 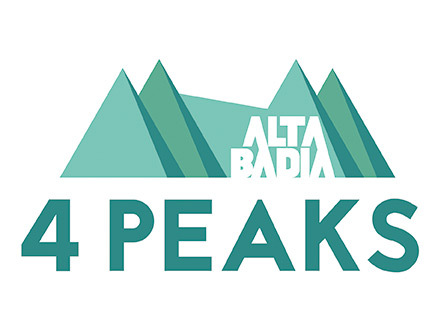 After a complete renovation, the new building housed the ski-pass offices, the Badia ski school, as well as modern ski rental and service facilities. 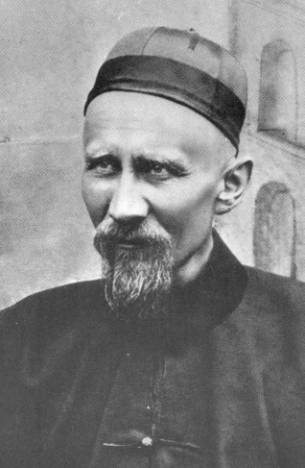 Those familiar with Badia know of the spirituality of the village, thanks in part to one extra special individual: Saint Josef Frëinademetz. Josef Frëinademetz was born on 15 April 1852 in Oies. In 1875 he was summoned to be a priest of the Diocese of Bressanone. 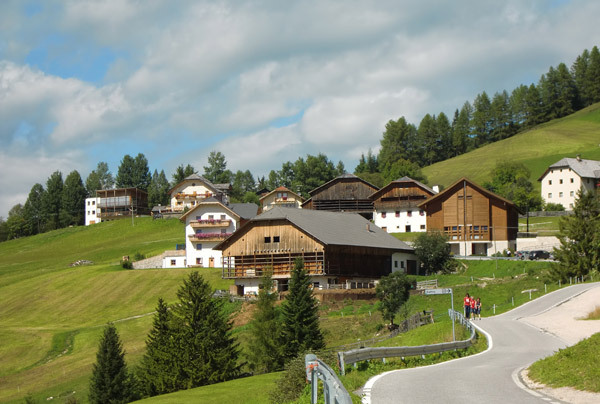 A few years later, he left his beloved Val Badia valley and travelled to Holland in order to prepare himself for life as a missionary. Afterwards, he travelled to Hong Kong where he dedicated himself to the Chinese people until the day he died. The South Tyrolean was undaunted by the bloody persecution of Chinese Christians. At the beginning of his missionary work, his religious community comprised 160 Christians. Twenty years after his death, his flock numbered 200,000. During his time as a missionary, Frëinademetz wrote numerous letters to his family, friends, and benefactors. He consistently thanked God for the tasks presented to him. In spite of his strength, one can sense a constant fear of losing his religious community in each of his letters. Everyone spoke of him as the embodiment of good. Nevertheless, his boundless goodness couldn’t spare him from death – Josef Frëinademetz died on 28 Jan 1908 at the age of 52. He was beatified in 1975, and in 2003 he was canonised. Today, the home where we was born in Oies has become a pilgrimage site. Numerous mementos, such as Chinese clothing and handwritten letters, can be found in his room. On the ground floor there is a chapel – in 1995 a small church was constructed next to the place of his birth, which is also a draw for pilgrims.